Old map by SCHEDEL - Sexta Etas Mundi. Folium. CCIIII. Title: Sexta Etas Mundi. Folium. CCIIII. Condition: Some marginal water staining in margins. Paper slightly age-toned. Dark impression on large sheet. Else good condition. 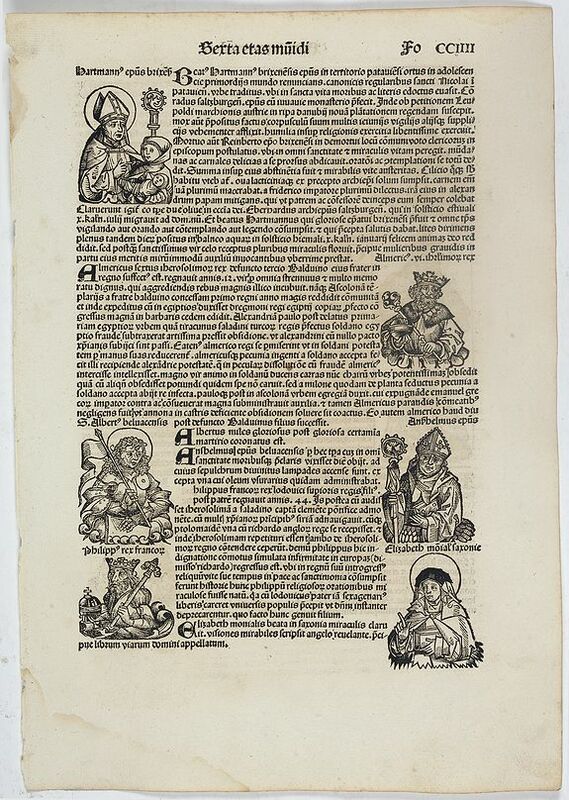 Latin text page with woodcuts on recto and verso of Saints, Kings, and Queens, among Philip, king of France. Elizabeth of Schoengau, Saxon nun, portrayed in her habit. Her right hand is raised in blessing, her left holds a book. The verso has a description of Year of the World 6384 - Year of Christ 1174.